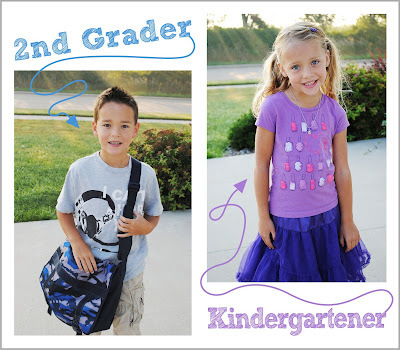 Yep, it's back to school for the kiddos. I had mixed emotions. A little nervous. Happy. Worried. Excited. You know like most Mom's I'm sure. I think they are ready for the school year. Both have great teachers and classmates so I know all is well. You're shy and gentle by nature but, your confindence grows each day. You are growing up way to fast and soon I will be begg'n you for hugs and kisses cuz, it won't be cool for you. You have to know that your smile is contagious and everyone around you will see that. Although you have a spunky side your sweet side is just as endearing. I can't believe you are going to be away from me for full days. Your creativity and artistic talents...leave us in awe. You are such a carefree and beautiful young girl. Mom and Dad are so proud of both you and love you way too much! 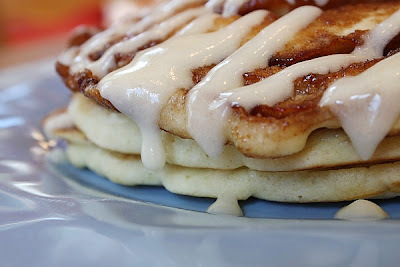 This morning as a Back to School treat I made these Cinnamon Roll Pancakes for breakfast. I can't even tell ya on how good these are. After the kids left it was these and a cup of coffee. Complete heaven.